PCI COMPILANCE is a fully configurable vulnerability assessment and reporting service for networks and web servers. Our remote audits run over 60,000 individual security tests on an organization's servers and then provide expert advice to help fix any vulnerability. Because Comodo is a PCI Council Approved Scanning Vendor (ASV), our PCI COMPILANCE Scan Control Center range provides everything a merchant needs to become compliant with the PCI vulnerability scanning guidelines. What does PCI stand for? The term PCI refers to The Payment Card Industry Data Security Standard - also known as PCI DSS. This is a set of standards to make sure any company that accepts, processes, stores, or transmits credit card information is secure. The PCI DSS is set and managed by the Payment Card Industry Security Standards Council (the PCI SSC ) founded on September 7th 2006. This is an independent body set up by many of the large credit card brands including Visa, MasterCard, JCB, Discover, and American Express. Security standards in the Payment Card Industry (PCI) are always improving to keep payment account security at its highest all throughout the transaction process. The PCI council is not held responsible for making sure members of a transaction follow security standards, this is always down to the acquirer or payment brand. Who does the PCI Data Security Standard (PCI DSS) apply to? All organizations who accept, process, store, or transmit any credit card information should follow the PCI DSS. The number of transactions or size of the organization is irrelevant. Can anyone see the PCI DSS? Yes, you can find the PCI Data Security Standard on the PCI Security Standards Council website here . What levels of PCI compliance are there? And which merchant falls into which? Based on the number of Visa transactions a merchant has carried out in the past 12 months, they will fall into one of four levels. The number of transactions for a merchant Doing Business As (DBA) includes all prepaid, debit, and credit card transactions. Visa acquirers have to include the volume of transactions from all DBAs if an organization has more than one name that it does business as. If the corporate entity doesn’t aggregate transaction data for more than one DBA, Visa acquirers will carry on considering only the DBA’s individual transaction volume to work out what their merchant level is. Merchants processing over 6 million Visa transactions every year including all channels or a merchant classed as a global level one merchant. Merchants which process between one and six million Visa transactions per year over all channels. Merchants processing over 20,000 and under one million Visa e-commerce transactions a year. Only e-commerce merchants which process fewer than 20,000 Visa transactions per year. Any merchant that has been compromised may be escalated to a higher merchant level by Visa. 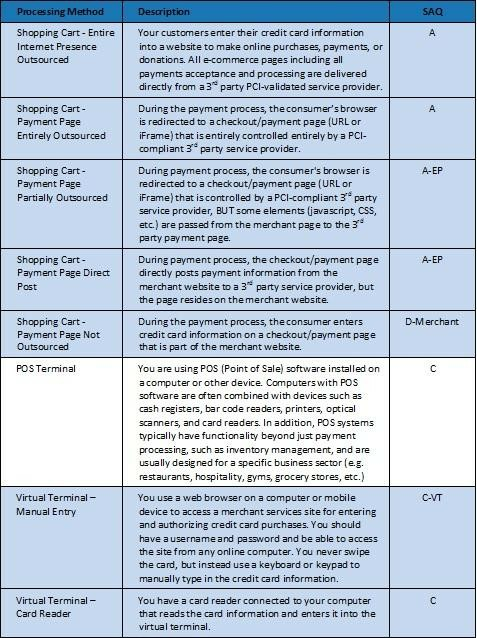 What does a level 4 merchant need to do in order to comply with the PCI DSS requirements? You then need to fill in the Self-Assessment Questionnaire that applies to your business. If your business comes under the categories of A-EP, B-IP, C, D-Merchant, or D-Service Provider, you will need to pass a vulnerability scan with an Approved Scanning Vendor (ASV). The Attestation of Compliance must be completed by a Qualified Security Assessor (QSA) or merchant to comply with the PCI DSS. This can be found in the SAQ tool. Finally, the business must submit the Self-Assessment Questionnaire along with evidence of passing a vulnerability scan (if applicable), and The Attestation of Compliance, and any other documents requested by your acquirer. Does the PCI DSS still apply to me even if I only accept card payments over the phone? Absolutely. Any business that stores, processes, or transmits transaction data has to comply. Does an organization need to be PCI compliant if it uses a third-party processor? Still yes. The company will still need to comply with the PCI DSS even if they use a third-party processor. The only way this helps is that it may decrease risk exposure and effort to prove compliance. If a business operates from multiple locations, do they all need to show PCI DSS compliance? Usually validation is only required once per year for all locations if your business locations all come under the same tax ID. You must also pass and submit a scan carried out by an Approved Scanning Vendor (ASV) if required under the Self-Assessment Questionnaire. My business only does e-commerce, which Self-Assessment Questionnaire should I use? Does my business still need to comply with the PCI DSS if it doesn’t store any payment data? Yes, PCI compliance applies to any organization that accepts credit or debit cards as a form of payment. It may be easier to comply with the PCI DSS than it is to store card data, as this always carries some level of risk. Which cards are classed as in scope for PCI? This includes any card that is branded with the five PCI SSC participating logos - Visa, MasterCard, JCB, Discover, and American Express. This applies regardless of whether the card is a debit, credit, or prepaid card. I have an SSL certificate on my site, does this make me PCI compliant? SSL certificates can’t prevent intrusions or malicious attacks, therefore they do not make a business PCI compliant. An SSL certificate secures the connection between the web server and the browser of the customer, and it shows that the owners of the website are a legitimate organization, but it does not provide PCI compliance. What methods can I use if I want my business to store credit card data? You may want to store card data if you want to set up recurring billing. The most secure way to do this is to use a tokenization service provider and have them look after the data for you. They will keep it all in a vault and give you a token that can be used for recurring billing. Doing this removes the risk from your business and puts it in the hands of someone who has maximum security to keep the credit card data safe. Storing this type of data yourself would require high standards of security, which may need to be checked by a Qualified Security Assessor (QSA) in order to comply with the PCI DSS. What if I don’t comply with the PCI DSS? Failing to comply can result in hefty fines, increased transaction fees, or even refusal of a bank working with you. Your merchant account agreement will outline your exposure if you’re unsure. Making sure you follow PCI not only helps your customers stay safe from cybercrime, it will also help you to avoid fines of up to $100,000 per month. What do the PCI Security Standards Council (PCI SSC) class as ‘cardholder data’? This means at least the full Primary Account Number (PAN). It can also include other customer details such as the service code, expiration date, or cardholder name. Any security-related information used to authenticate cardholders or authorize payment card transactions may be transmitted or processed but may not be stored as part of a payment transaction. This is known as Sensitive Authentication Data. What does the PCI SSC define as a ‘merchant’? Any entity that accepts payment from cards branded by a member of the PCI SSC (Visa, MasterCard, American Express, Discover, or JCB) in exchange for goods or services is classed as a merchant. Note that being a merchant is not mutually exclusive from being a service provider. What is the definition of a ‘service provider’? Any business entity that is not a payment brand and is not directly involved in processing, storing, or transmitting cardholder data. Any company providing services that could impact or control the security of cardholder data is also classed as a service provider. What does the term ‘payment application’ mean? In relation to PCI compliance, any piece of software that has been designed to handle card data is known as a payment application. This includes anything that transmits, processes, or stores credit card data electronically. A Point of Sale (PoS) system like those used in restaurants and bars is classed as a payment application, and so is any e-commerce shopping cart used on a website. What is the definition of a ‘payment processor? Also known as a ‘payment gateway’ or ‘payment service provider (PSP)’, a payment processor connects a merchant to the bank or processor that handles the connection to the card brand. The payment processor handles card transactions on behalf of a merchant or other entity and routes inputs taken from applications to the appropriate bank or processor. What is the Payment Application Data Security Standard (PA-DSS)? The PA-DSS is maintained by the PCI SSC to ensure the security of payment applications. It is there to make sure that any vendor provides products in line with a merchant’s compliance with PCI DSS and avoids storing any cardholder data. Any application validated by the PCI SSC is maintained and published in a list. Can you print the Primary Account Number (PAN) on a customer’s receipt? To comply with the PCI DSS, the full credit card number must be sufficiently masked so that only the first six and last four digits are displayed at most. Any paper receipt in possession of a merchant must comply with the PCI DSS in order to ensure security. This does not supersede other requirements regarding displays of cardholder data such as the Fair and Accurate Credit Transactions Act (FACTA) or other laws regarding paper receipts. Is a vulnerability scan required to be PCI compliant? What’s involved in a vulnerability scan? An Approved Scanning Vendor (ASV) will carry out the scan using an automated tool to search for vulnerabilities in a merchant or service provider’s system. 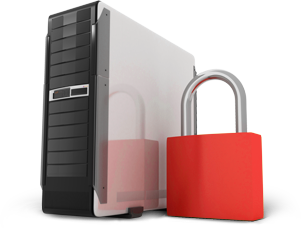 The scan is non-intrusive and requires no software to be installed, nor any denial of service (DOS) attacks. It involves reviewing web applications and networks based on the IP addresses given by the service provider or merchant. The ASV will be able to identify any vulnerabilities you may have that would allow hackers to gain access to a private network through an operating system, service, or device. Do I have to have a vulnerability scan more than once? Yes, an Approved Scanning Vendor (ASV) will need to conduct a vulnerability scan once every 90 days. Your acquirer will determine a timetable letting you know when to submit successful scan reports in order to be PCI compliant. What happens if I don’t comply with the PCI DSS? As it was created by the major card brands (Visa, MasterCard, Amex, JCB, and Discover), PCI is not an official law. Any merchant that doesn’t comply with the PCI DSS may be fined, subject to costs, or suffer damage to the brand’s reputation if security is compromised. Complying with the PCI DSS carries some cost and effort upfront, but hugely decreases the risk of facing these consequences in the long run. Am I more vulnerable to hackers if I run my business from home? Operating from home will often carry with it more vulnerabilities than a professional environment. This is due to home users often leaving their internet always on, as well as the personal use of software like file sharing applications and games which can sometimes be exploited. If hackers know that a business is run from an owner’s home, they may be more likely to target it. An Approved Scanning Vendor can help to scan for vulnerabilities and help home-based businesses to improve their security. What should I do if security is breached or my business is the victim of a cyber attack? PCI compliance will protect you from most vulnerabilities and exploits. However, it is not the be all and end all; there is always a slim chance that hackers could breach your security measures. Are there laws requiring entities to notify affected individuals of a security breach? In the U.S., nearly every state now has laws in place requiring security breach notifications. At the time of writing, 48 states legally require private, governmental, or educational entities to notify anyone affected by a security breach involving personal information. The first state to implement these laws was California - back in 2003. 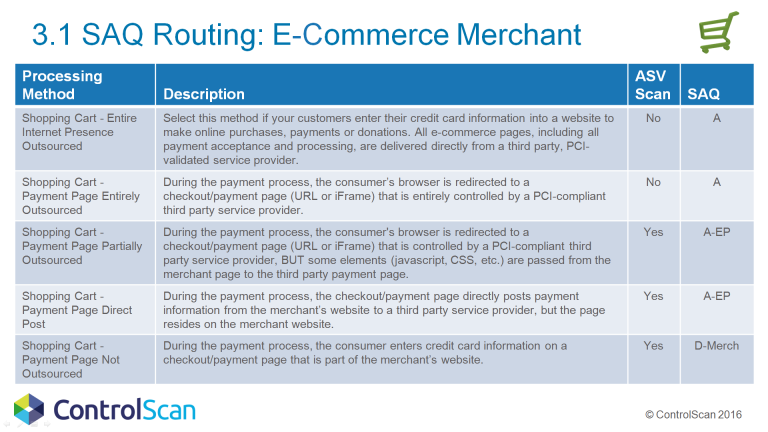 PCICompliance.com allows merchants to become and stay PCI compliant. PCICompliance.com’s mission is to make PCI DSS Compliance easy and simple for merchants who cannot afford expensive audits. This drives us to create simple, affordable and easy to use solutions. ©2019 PCI Complilance. All rights reserved. Message: simplexml_load_file(): I/O warning : failed to load external entity "https://www.pcicompliance.com/assets/front/default/xml/home.xml"